In Avoid Sharks BBC video, we can learn new discovery about our lovely turtles. Unexpectedly, sharks are turtle’s predators. Turtle has a strong shell which cannot be bitten. They pulled to hide their bodies in their shells for self-protection. 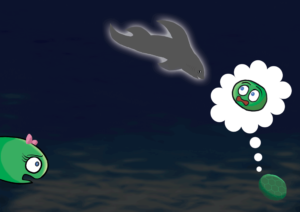 The night is the most dangerous time for turtles especially if there are sharks swimming around. Thus, they have to hide and be still. We can observe a tiny fish hiding around the rock. Once they move, it will send out electrical signals. Sharks can sense it. Hence, the sharks feed on the fish. During night time, turtles have to do careful dance around the sharks to protect themselves from being eaten. Some turtles hide in the cave. Then they return to the surface and leave the cave. However, there are instances of some turtles which hide in the cave lose their way and drowned. Poor turtles. Yes 😊 turtles are special creatures. They still can dance around the sharks 🦈 in order to escape from them. An interesting findings about them.